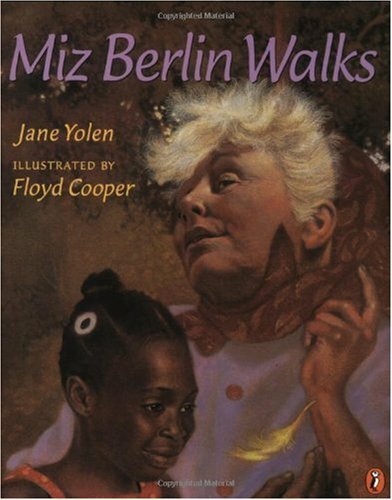 Every day, Miz Berlin walks around the block, talking. When a young girl follows her one evening, she is amazed to find that the old woman is telling stories. She ends up walking with her every evening afterward, and they build a friendship, the bond of which outlasts even life itself. two Nebula Awards, two Christopher Medals, the World Fantasy Award, three Mythopoeic Fantasy Awards, the Golden Kite Award, the Jewish Book Award, the World Fantasy Association's Lifetime Achievement Award, and the Association of Jewish Libraries Award. Floyd Cooper received a Coretta Scott King Award for his illustrations in The Blacker the Berry and a Coretta Scott King Honor for Brown Honey in Broomwheat Tea and I Have Heard of a Land . Born and raised in Tulsa, Oklahoma, Mr. Cooper received a degree in fine arts from the University of Oklahoma and, after graduating, worked as an artist for a major greeting card company. In 1984, he came to New York City to pursue a career as an illustrator of books, and he now lives in Easton, Pennsylvania, with his wife and children.